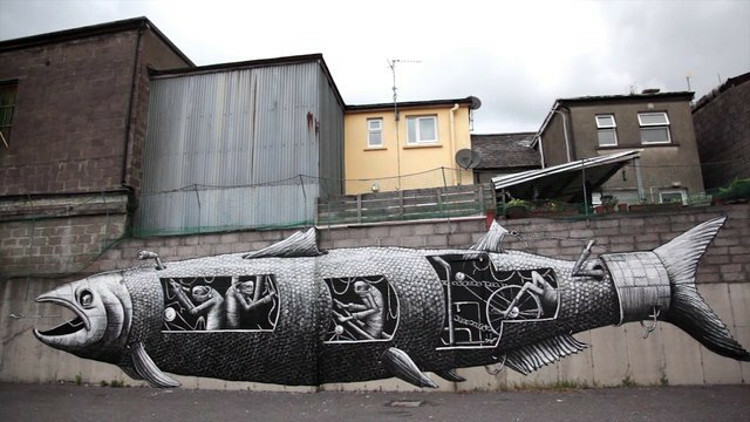 Phlegm is a British muralist and artist who draws his environment into the narrative. He first developed his illustrations in self-published comics, and he still creates books of ink drawings. At one point he began developing his characters presented in a medium of murals. These are highly detailed with a very bold idea. The artist’s work is striking and it will not leave anyone ambiguous. His works are mostly featured in the urban landscape, and run-down spaces. His surreal illustrations tell a story untold, as his imaginative creatures explore the visual narrative. 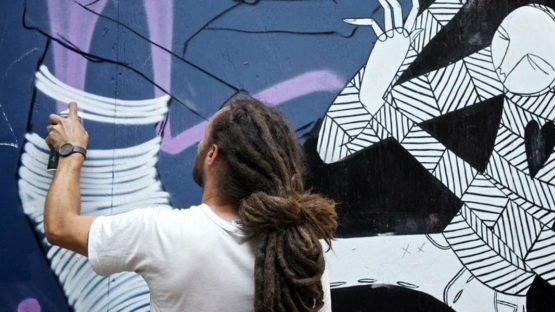 Even though he started as a cartoonist, street art has become his main interest over the years. The way how the artist incorporates his art into city architecture is influenced by the surroundings and makes it more alive than a canvas in an art gallery. 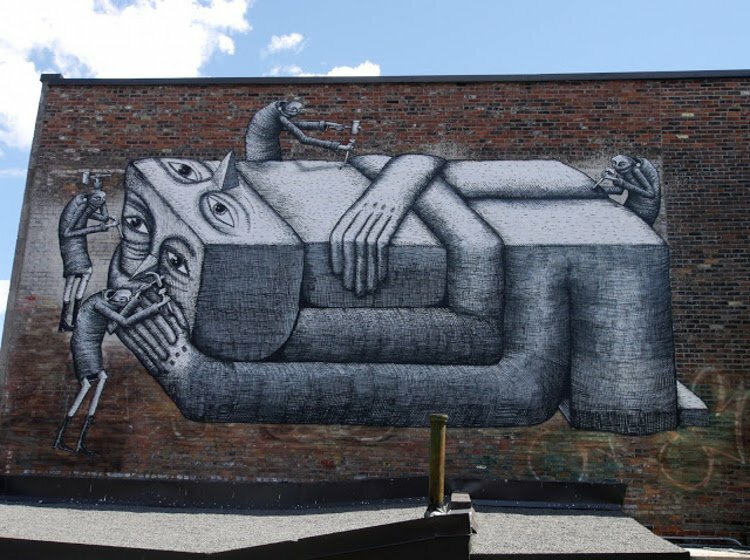 Phlegm comes from Sheffield, which makes this town filled with his works, especially in old, abandoned parts of town, with factories scattered, their use took away from them. Phlegm brings new life and meaning to these places as he enriches them with his new monochrome world. The majority of Phlegm’s artwork is strictly illustration-based. He leaves his street artwork and murals for his cartoon-based art. In fact, that majority of his large characters originate from his comics and they are often spray painted onto very large walls. Phlegm prefers to paint his comic work with black Indian ink and a dip pen. Each drawing forms part of a grand narrative that extends worldwide, in countries including Norway, Canada, Switzerland, Sri Lanka, USA, Belgium, Poland, Italy, Slovakia, Spain, and Australia. His work has also appeared in a variety of objects such as airplanes, boats, buildings, vehicles and many street art festivals. The artist’s name comes from one of the four bodily humorous in ancient Greek medicine: blood, yellow bile, black bile, and phlegm, the latter believed to be responsible for an apathetic and unemotional temperament. Phlegm uses long-abandoned warehouses and factories to depict with his phantasmagoric narrative. The artist’s work is all done using Indian ink with a dip pen, as he uses color only when he is screen-printing or painting large murals and other objects. 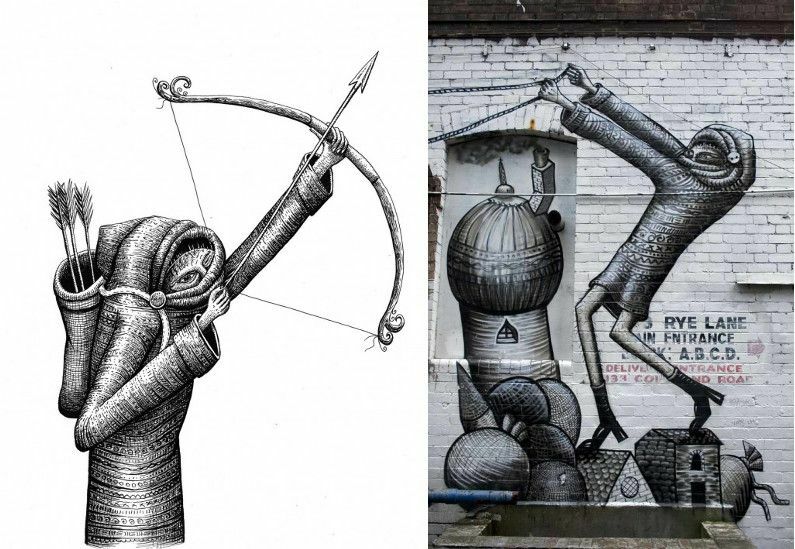 Phlegm’s characters have something menacing to them, along with a childlike aspect. His imagery is set up in cityscapes with castles with winding stairways and turrets. Occasionally, his long-limbed half-human characters, with woodland features will find their place in a city they are depicted on. The dream world he creates conveys impossible flying machines, networks of levers, pulleys, and cogs. We don’t ask for the meaning of telescopes and magnifying glasses because Phlegm’s pieces are in a way self-explanatory, and completely meaningful in the world they create with the space around them. The artist opens a cabinet of the mind, working solely in monochrome, the intricate detailing awake curiosity with the viewer as they are derived from it.